If you are a bankruptcy attorney and either using AdWords or want to use AdWords or just want to do some natural search keyword research, then the keyword list below will bring you many new clients. It is a list of all keywords that have converted for one of our satisfied bankruptcy clients. If uploading and organizing these keywords will take you away from managing your law practice then contact us and we can manage everything for you. We may be able to offer a 60 day risk free trial for AdWords management and allow you to get back to running your law firm. If these keywords don’t help you generate leads for around $50 per call or contact form (if you are using Google AdWords. For SEO this is not pertinent) then please contact us. We also have a lot of experience and success helping family law attorneys. These are the results we are seeing with this keyword list for our clients. Lately we have been able to generate even better results for our bankruptcy clients using a few tricks we have learned along the way. And for your convenience here you can see the results we achieved. CPL stands for cost per lead or cost per conversion. The cost per lead (CPL) is the cost to receive one contact form submission or phone call. And if you also target family law you might want to check out this page. now let’s move along to reviewing the results we have been seeing for our clients with the keyword list above. remember the cost per lead is the cost to receive a phone call or contact form submission. And here are the results for a different client. Results can vary based on how well your website converts and location. Below we will continue with some more ideas about bankruptcy keywords. First you want to give you an opportunity to reach out to us for more information about our 60 day risk-free trial in case you don’t want to spend your valuable time setting up or improving an AdWords account. Here is a call summary for one of our bankruptcy clients. This gives you more insight into the results you can expect when using these keywords if you set up the campaign properly. And if you are seeing results similar to what we are highlighting here you can give us a call and we can help set up the account for you. 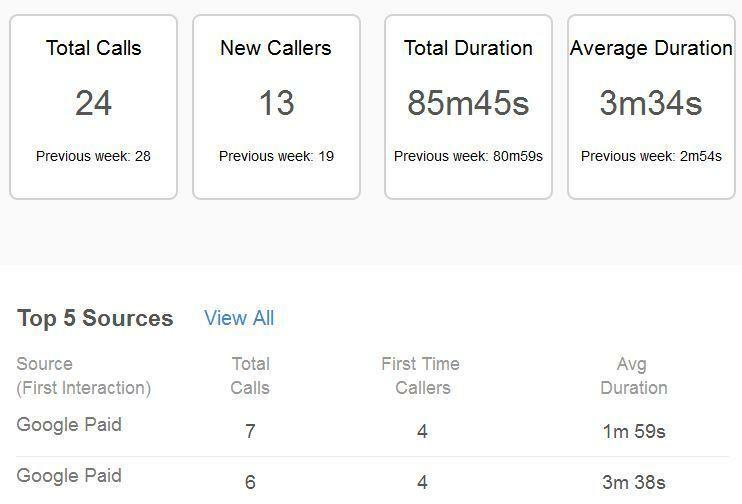 The call summary below was for a week in which our client spent $337 on paid search. Not all the calls are from PPC (further down you’ll see the breakdown from 2 different PPC campaigns). Notice below there are some repeat callers who have called before. That’s a good sign that people are calling back for more information. Note also the decent average call length. That’s a sign of good call quality and good keyword quality for the keywords we are targeting with Google AdWords. Now take a look at some data of average call length at the keyword level. This is really helpful insight we are able to share with our clients. This is just data from one week so isn’t as insightful as keyword data that is aggregated over several months. Call length is an indication of keyword quality and can help optimize your account. Many PPC management agencies don’t go to these lengths to pinpoint both the best keywords and potential wasted spending. If you also have other practice areas you should take a look at our page geared towards personal injury attorneys. Often we can generate leads for personal injury attorneys under $200 per lead. And if you’re looking to also generate family law leads we can usually generate those for between $30 and $80 per lead. You can notice the “state name” and “city name” keywords. Most people are usually looking for local law firms in their area, so it is really important that you add keyword multipliers containing the city and state you are in. Is a great idea to compare the cost per conversion we are seeing above with the cost per conversion you are already seeing or will be seeing for these keywords in your AdWords account. 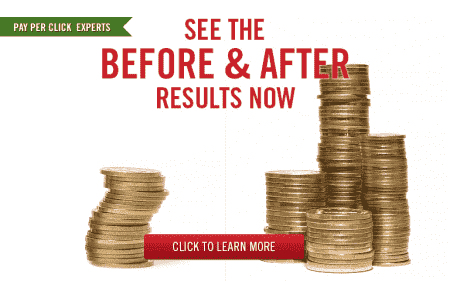 If your results are consistently worse than ours then it may be worthwhile to give us a call at 800-645-9521 and have the professionals at Webrageous improve your account. You can see in the keywords list that some keywords have a better cost per conversion than others. If you use the keywords above and you notice that after a while some of them do not bring much conversions but they cost a lot (therefore generating a very high cost per conversion), it might be wise to pause them. However make sure before pausing them that even if they are not bringing a lot of direct conversions, they are not bringing a lot of indirect conversions. Some keywords may indeed not bring direct conversions but they may play a crucial role in assisting conversions and if you do pause them, you will see the number of conversions decrease dramatically. Sometimes several previous searches are necessary to lead to the final conversion and the last click before conversions shouldn’t get all the credit, as previous clicks or impressions triggered by other keywords may assist your last converted click. Another practice recommended is to add negative keywords. A keyword as generic as “bankruptcy” will more than likely bring irrelevant searches that won’t help your bankruptcy law firm get new clients. The following negative keywords could be added to start: auctions, benefits, guide, blog, forum, guide, gif, house, home, jobs, jokes, journal, mortgage, loans, news, petition, quotes, quiz, software, wiki, youtube, free… Another good practice is to keep on adding new negatives once your AdWords campaigns have been running for a few days, by downloading the search query report on a regular basis and adding the keywords that triggered irrelevant searches as negatives. You should also add variations of your keywords in each match type and maybe create a separate match type per ad group, as it will be easier to analyze the results by match type. I would advise you to use phrase, exact, and maybe broad match modifier instead of broad which may bring too generic searches. Once you have performed all those steps, you will certainly have a good keyword basis to start with, but don’t think you won’t need to work on your keywords anymore. AdWords is a long-term commitment and to be successful and stay ahead of your competitors you will need to analyze and optimize your keywords on a regular basis, downloading the search query reports and analyzing search terms, adjusting bids, pausing keywords that are under performing or costing too much money. Finding good keywords is just the tip of the iceberg in AdWords, and you now need to organize them by different themes, and create a different ad group for each theme. Ideally Google indeed recommends to limit the number of keywords to 10 to 20 per ad group. Another crucial point in AdWords is to write eye-catching ad texts. Competition is quite high in the law firm industry so your ad will be the one thing making you stand out from your competitors. You need to write a great headline that will make your firm unique, and you should use all characters available to highlight your experience and your ability to solve your potential clients’ problems, and you should think of a great call to action. The best practice is to think about what really makes you stand out and highlight it in your messaging. AdWords ad texts have limited characters, so if you can’t highlight all the benefits that potential clients would get by contacting you, do not forget to use ad extensions as they are a great way to add more messaging and get a higher CTR too. You should definitely use sitelinks leading to different pages of your website and call out extensions where you can add benefits up to 25 characters. I would also recommend you to use call extensions so that people can call you directly by clicking a button on your ad, and of course location extensions as previously stated people usually look for local law firms and location extensions will help them find your firm with no hassle. You should also choose the best landing page to redirect people to after they click on your ads. This landing page should ideally mention all the benefits mentioned in your ads. Ideally it would be good to use a different landing page in each ad group so that each page is highly relevant and you get a higher quality score. You can also use different landing pages and do some A/B testing to see what works best as a slight change in a landing page may bring totally different results in AdWords. Once your AdWords campaigns have been running for a while it may be a good idea to analyze performance by device and adjust bids accordingly. It is indeed possible in AdWords to set different bids for each device: desktop, mobile and tablet, and you should take advantage of this opportunity as each device may bring totally different performance. You could also analyze performance and adjust bids by locations, days of the week or hours of the days if you don’t want to spend too much money. So as you can see AdWords is not only about finding the right keywords and initial set up, you will also need further optimization if you want to get the most out of your AdWords campaigns. So if this all seems too complicated and you just want to focus on running your bankruptcy law firm and not on managing AdWords then give us a call at 800-645-9521! Or visit our 60 day risk-free trial page for more information about this exciting offer. It is very important for attorneys to get things right in AdWords as it is a very competitive industry and you might end up losing a lot of money if you are not sure of what you are doing.